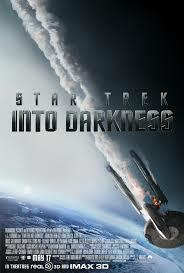 ”STAR Trek Into Darkness” goes where no other “Star Trek” film has gone before – into 3D, IMAX and action overload. All were wholly unnecessary and bear no resemblance to a “Star Trek” film, except maybe its predecessor, 2009’s presumptuously titled “Star Trek,” the 11th entry in the classic film franchise. The result is a hackneyed science fiction B film made with as much of the state-of-the-mart technology that could be squeezed into its 2¼ hours. (WARNING: Once you put on those IMAX glasses, you are committed. Take them off and things become blurry; see video above). An aside: For a film with three writers, "Star Trek Into Darkness" is very light on engaging dialogue. “You’ve been played”? Seriously? Is this the way a Starfleet admiral speaks in the 23rd or any century? The film has been dumbed down in too many ways to count. It has a coarseness to it that is decidedly not Trekian. Surely, Gene Roddenberry is rolling his eyes in his grave. A meeting of the minds before the madness at Starfleet Command in "Star Trek Into Darkness." Photos courtesy of Paramount Pictures. “Star Trek Into Darkness,” which makes its U.S. debut today, has more in common with a “Fast & Furious” than the latest entry in the Star Trek movie franchise. On one hand, it is not so surprising. JJA – a renaissance man of sorts who dabbles in TV and film as a director, writer and producer – directed “Mission Impossible III.” Ditto for the TV series “Alias” and “Lost” on which he wore several others hats, too. He also has an interest in the TV series “Person of Interest.” On the otherhand, the TV projects didn’t/don’t skimp on intelligence. Alas, most of the intelligence has been suctioned out of “Star Trek Into Darkness.” How unfortunate, because there are many opportunities for it to flourish in this second installment in the trilogy that JJA&Co. have planned. 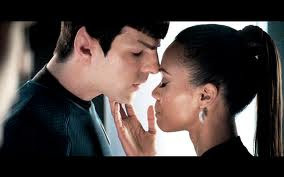 Take the romance between Uhura (Zoe Saldana) and Spock, played to perfection by Zachary Quinto. Yes, Spock and Uhura, not Uhura and Kirk (Chris Pine). There is too little of this interplay, and much of what there is of it casts Uhura in the mold of a shrew. This is as much out of character as is Uhura and Spock as a couple. At least, though, the latter scenario is interesting. Exploring this relationship in any real depth or cleverness would also be veering toward the quadrant of chick flickdom. Make not mistake. “Star Trek Into Darkness” is meant to appeal to males between 12 and 50. 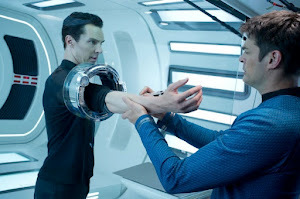 Dr. McCoy (Karl Urban, right) takes the measure of the man called John Harrison” (Benedict Cumberbath) in "Star Trek Into Darkness." Indeed, a treasure trove of thoughtful dialogue could have been excavated from the basic plot and subplot of rogue agent “John Harrison” (Benedict Cumberbath) attacking Starfleet headquarters, then fleeing to the Klingon homeworld of Kronos where newly reinstated Captain Kirk is permitted to lead an away team to pursue and destroy him. Any “Star Trek" film featuring Klingons has instant swagger. They are the coolest bad boys and bad girls in the known universe, and they are dressed to kill! 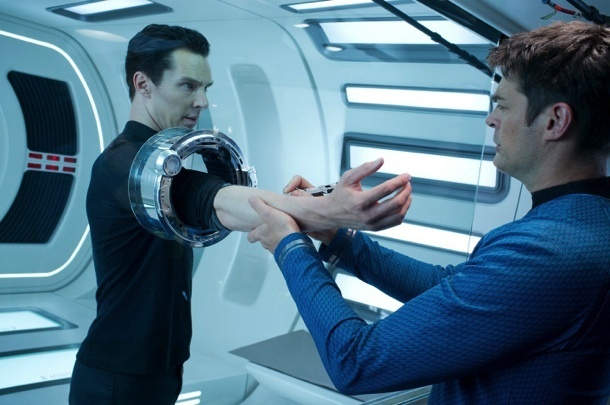 Here, they get about two minutes of screen time before they are vanquished, mostly by John – “Khan? !” – yet another plot twist that gets insufficient exploration in the name of action. What a waste! Unlikely lovers in "Star Trek Into Darkness": Spock (Zachary Quinto) and Uhura (Zoe Saldana). Incidentally, one place that "Star Trek Into Darkness" does not spin out of control is in the casting. The actors playing the primary characters, from Captain Kirk to Mr. Chekov (Anton Yelchin), strongly suggest their predecessors in their physical characteristics. However, Kirk is a touch too brash and bull-headed, whereas Mr. Chekov is uncharacteristically a harried, almost feckless sort. Otherwise, this is not your film, especially if you are a Trekkie. Consider yourself forewarned, Trekkies.